2012 Triumph Bonneville SE. Picture credits - Triumph. Submit more pictures. Take a Bonneville. Spec up. Enjoy. The most famous name in motorcycling. A legend. Over 50 years of engineering excellence. A thoroughly modern interpretation of the authentic �proper� motorcycle. This iconic symbol of rebellion and independence is even more appealing thanks to its modern specification, low seat, fuel-injected 865cc engine and lightweight 17 inch alloys for even sharper handling. Price as new (MSRP): US$ 8399. Prices depend on country, taxes, accessories, etc. Frame type: Tubular steel cradle. Swing arm: Engine. Ask questions Join the 12 Triumph Bonneville SE discussion group or the general Triumph discussion group. Click here to sell a used 2012 Triumph Bonneville SE or advertise any other MC for sale. 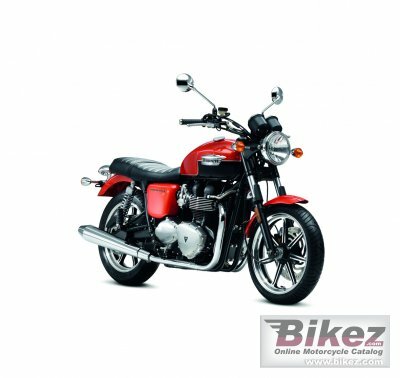 You can list all available Triumph Bonneville SE bikes and also sign up for e-mail notification when such motorcycles are advertised in the future. Ads with or without pictures are easy to create. Our classifieds are completely free with sections for every country in the world. You can also check out our list of related motorbikes. Compare technical data. Look at photos. View your fellow riders' rating of the bike's reliability, design, engine performance, accident risk, repair cost, etc.